Just like all the other Kindle comparison reviews that I’ve done over the past few years, when comparing the Kindle Paperwhite 3 with the new entry-level Kindle for 2016 the differences all come down to hardware. All the current Kindles from the $379 Kindle Oasis 3G down to the new $79 Kindle have the same software with all the exact same reading features. The one exception would be the previous base Kindle doesn’t support the VoiceView accessibility tool that can read screen content aloud, and that’s probably why it got replaced. Even the Paperwhite 2 has the same software and features as the newer Kindles (aside from VoiceView, of course). So when it comes to choosing a Kindle the only thing you really need to consider is the different hardware configurations. There’s a lot of overlap when it comes to specs as well. The current lineup of Kindles all have the same exact 1GHz processor, the same amount of RAM, and the same 4GB of storage space, so speed and overall performance is pretty much identical between them. There are six main differences between the Kindle Paperwhite 3 and the entry-level $79 Kindle. Frontlight: The Kindle Paperwhite has a frontlight to illuminate the display, which helps make the screen appear whiter and improves contrast, and makes it better for reading in low light, whereas the entry-level Kindle has no light, which makes the screen look darker and grayer, and it requires using a reading light or lamp. Screen: The Kindle Paperwhite 3 features a 300 ppi E Ink Carta display with a resolution of 1448 x 1072. The entry-level Kindle only has 167 ppi with an 800 x 600 E Ink Pearl screen—an older screen tech that ebook readers used like 5 years ago. The text is a lot clearer and sharper on the Paperwhite’s higher resolution screen, especially smaller text sizes, and the screen background color is a lot whiter and the text is darker. The one benefit with the lower res screen on the entry-level Kindle is the fonts are thicker and bolder. Battery: The Kindle Paperwhite 3 can last up to 6 weeks per charge, whereas the $79 Kindle’s battery can last up to 4 weeks per charge, based on 30 minutes of reading per day, according to Amazon’s numbers. 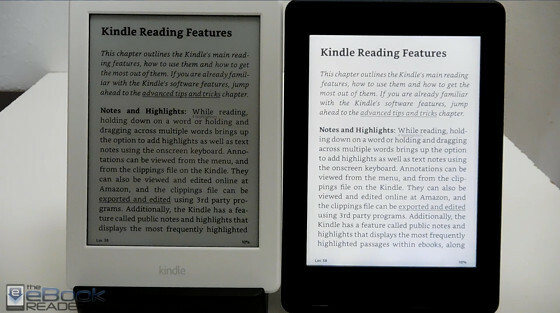 Design: The entry-level Kindle is slightly smaller and lighter, and the edges are more rounded. The plastic has a bit of a budget quality feel compared to the nicer finish on the Paperwhite, which also adds a rubbery coating to the back, and the Paperwhite’s build quality feels more solid overall. Bluetooth: The entry-level Kindle adds Bluetooth support for using the VoiceView and text-to-speech accessibility features, whereas the Paperwhite has to use a separate USB dongle (see Kindle Audio Adapter review for more info). Price: The entry-level Kindle is $79 for the Special Offers model and $99 for the non-ad model. The Kindle Paperwhite 3 sells for $119 with ads and $139 without; add $70 for the 3G models. Both are available in white and black. Size: The new Kindle is a bit smaller than the Paperwhite and it shaves off some weight with the smaller battery. Kindle Paperwhite 3: 6.7″ x 4.6″ x 0.36″ (169 x 117 x 9.1 mm); weight 7.2 oz (205 grams). Kindle: 6.3″ x 4.5″ x 0.36″ (160 x 115 x 9.1 mm); weight 5.7 ounces (161 grams). Touchscreen: The Kindle Paperwhite 3 has a capacitive touchscreen and the $79 Kindle has an infrared touchscreen. Both offer pinch-zooming and effectively work the same, so not much difference there, other than the screen is more recessed to accommodate for the infrared sensors. Plus infrared screens are more sensitive and work better with a stylus. 3G Wireless: The Kindle Paperwhite 3 has the option for 3G wireless, whereas the basic Kindle is Wi-Fi only. More comparison info between these two Kindles and all the other models past and present can found on the Kindle Comparison Table. I have a general question regarding the kindles. When you go to Amazon and to the kindle department, how do you know which kindle is which? I mean the paperwhite models. It shows a paperwhite model but how do I know it’s the paperwhite 1, 2 or 3? There seems to be no visible differences between those so how do I specify I want a PW3 rather than a PW2? For one they have the older models marked as previous generation and they have a link directing to the newer models saying there’s a newer version available, like the 2014 Kindle that was just replaced.